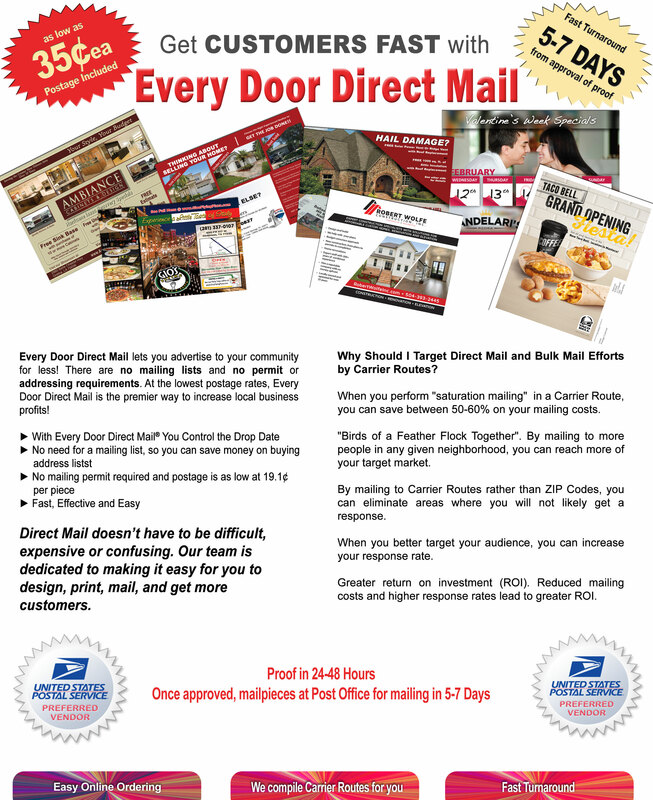 United States Postal Service (USPS) mail is divided into zip codes and then subdivided into postal carrier routes. Each carrier route has between 400-800 deliveries in them. Postcards are oversized – not standard 4x6 or 5x7. We have many sizes (6.5 x 8), (6.5 x 9), (6.5 x 12), (8.5 x 11), (9 x 12)– All have the same postage rate (18.7¢). This ensures that your message will be seen first as they are larger than average size. ►Step 1: Choose a Design we have, Upload Your Own Design (Print Ready Files Option) or let us design a postcard for you (Graphic Design Option). Any design you choose on our website will be custom designed for your business. NO JOB IS PRINTED WITHOUT YOUR APPROVAL.